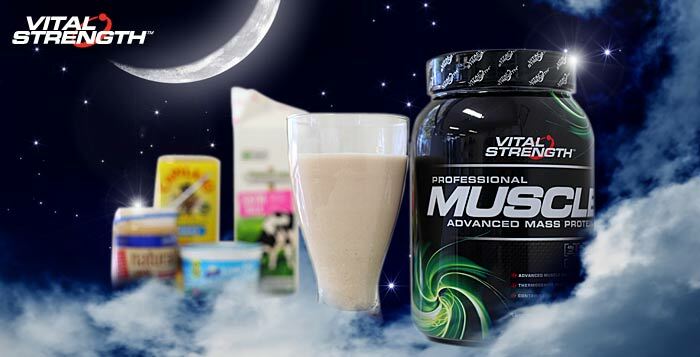 If you’re looking to maximise muscle growth while you sleep, you need a protein shake before bed that is specifically designed to take at night. Consuming a protein shake just before bed has been a practice of elite bodybuilders for many years. During sleep your body goes into a fasted state, meaning your body begins to store fat and use protein for energy. If there is no available protein the body goes into a catabolic state, breaking down hard earned muscle tissue instead! Now don’t freak out, this is quite normal, but if you want to maximise muscle growth during this time you need a protein shake before bed that contains the right nutrients to stave off this catabolic effect and promote muscle growth. To help build muscle while you sleep your body needs a slow and prolonged release of protein. The anti-catabolic ingredients in this recipe combine to give you the ideal mix of slow digesting proteins and amino acids in a delicious protein shake before bed. 3 scoops chocolate Vitalstrength Pro-Muscle protein powder. Simply add all the ingredients to a blender and blend until smooth. Rich in casein, cottage cheese is a great protein source, especially for the before bed protein shake. Casein protein is the slowest-digesting protein you can eat, meaning it prevents your muscles from being used as an energy source while you fast during the night. Natural peanut butter is extremely rich in monounsaturated fats and high in protein. It’s helps slow down digestion even further so it a perfect inclusion in your protein shake before bed. 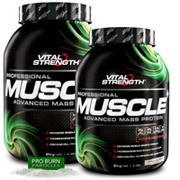 Vitalstrength Pro Muscle is a high protein mass gainer that contains a multi-phase protein matrix of slow, medium and fast digesting proteins that feed your muscles with amino acids at varying rates during the night. Glutamine is widely used by athletes for its beneficial effects on healing, recovery, immune function and muscle growth. It is the most abundant amino acid found in muscle tissue that becomes depleted after an intense training session. A teaspoon of Glutamine is an ideal addition to your protein shake before bed.